Wednesday night Bible Study began the series on “The Historical Jesus." 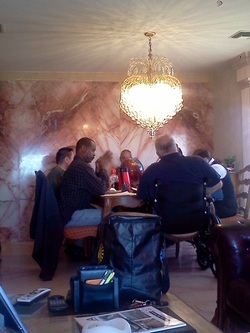 Met & provided readings for the Music Ministry to help in the planning of music for each month. Met with someone who called the church and wanted to speak with the pastor. Met with Victor Santana-Malgoza on the 24th of October concerning our upcoming Diversity Sunday. Met with co-chairs for Border Interfaith. Attended a Steering Committee meeting for Border Interfaith. Attended a celebration for Aaron and Edgars wedding ceremony. I have continue to attend a “Clergy Liturgy Group” at First Presbyterian Church on Wednesdays at 9:00 a.m. The pastors are Rev. Neal Locke, Rev. John Nelson, and Rev. Jessica Brannan. Planned and presided at the October 13th “Homecoming/Coming Out” service and picnic. Met with one couple concerning an impending wedding. Visited and provided communion for Linda Jiles at the Franklin Heights Nursing Home. 3 times this past month. Also brought her a copy of the constant contact and let her view the church’s latest video. Participated and officiated at the Board of Servants meeting on September 24, 2013. Evaluate meeting last Thursday with George Hejtmenek.